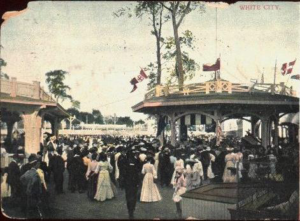 In 1907, White City Amusement Park opened in the area that is now known as Spring Lake in the John A. Roebling Memorial Park. The park was located at the end of Harrison Avenue, at its intersection with McClellan St. It ran from Sewell to Buchanan Street. The area above the bluffs is residential now, but from Spring Lake, the ornate concrete staircase that once allowed park visitors to descend to the promenade around the lake can still be seen. By the late 1800s, a trolley company had run its tracks out to the Broad Street Park development. The company bought land that was a popular picnicking location, including the DeCou mansion, some parkland, and a lake, and built an amusement park on the bluffs, in the hope that the amusement park would help make the trolley line profitable. The new park was called White City Park because all of its buildings were painted white, following the fashion of the time. In its heyday, the park boasted a roller coaster, carousel, and scenic railway, among the other rides. They had a Katzenjammer Castle, Mystic Maze, movie theater and other attractions. There was a dancehall with bands playing along the midway. White City’s water flume ride had gondolas that descended from the park above, down the cliffs on concrete chutes and into the lake. There were boating and fishing on the lake, then known as White City Lake. In the winter, people used the frozen lake to ice-skate. However, with the advent of the automobile, White City Park declined in popularity as people went elsewhere. The park was abandoned in the late 1920s. Broad Street Civic Association, which formed in response to a development threat in the late 1930s, by 1957 had successfully acquired 317 acres, including White City Park, with considerable financial support from the Roebling family. This land, which became the John A. Roebling Memorial Park, was turned over to Mercer County in 1957 for $1 as a designated wildlife refuge designated for passive recreation. For description of recent restoration of the White City Mansion, click here.